There are two methods of stretching bed cloth. The first and most effecient method is stapling. However, your slate must have a wood backing for this method. If your slate is backed, there will be 3/4" lining of wood directly underneath the slate. If not, gluing the cloth to your slate is the next best option. Both methods are equally effective, but stapling is just faster and cleaner. You will want to stretch your cloth lengthwise down the table first. Staple the cloth on the end by starting in the middle and working your way to the outside. We usually put staples about 2 to 4 inches apart. Go to the other end and pull the cloth, starting in the middle, as hard as you can. It is important to get the cloth as tight as possible. Once your cloth is fastened in the center, you can start working your way to the edge. 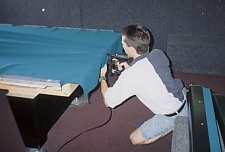 Pull the cloth with equal stretch on each pull. Consistency is important here. An inconsistent stretch at this point may cause the balls to wander or do unexpected maneuvers when playing. It is definitely an undesirable trait of a pool table. Once your ends are fastened you can start on the longer sides. Start in the middle and work your way to the end. Be careful not to pull to tight on the first side. This will leave your other side too short. The most important things to remember when stretching cloth is tightness and consistency in the stretch. If you are using glue, use the same method as above. Spray the adhesive (3M Super 77) about five inches in from the edge of the table. Only do one end at a time. Also, spray the same edge of the cloth. Two edges with glue go together are much better than one. Wait for the glue to get tacky, about 30 seconds, then press the cloth to the slate. Go to the other end and do the same thing. 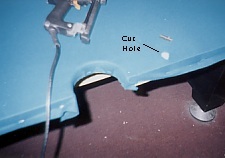 When the cloth is secure, use a razor blade to cut holes in the cloth where the rail bolts will come up to the rail. There are three holes between each pocket. Use your finger from the bottom up to find the right hole. Never try and find the hole from the top down. Some tables have more than three holes on the top. A cut in the wrong place may ruin the cloth for the whole table. Once the holes are done, the pockets are ready to be cut. Make at least three slices on each pocket. The middle pockets will usually need four. Be sure not to cut less than 1/2" from the edge of the slate. You don't want to cut the cloth too close to the actual playing surface. It is also a good idea to use a 1 1/2" strip of cloth to line the inside pocket. This will help the table look better because the slate and wood will be completely covered.